Macoupin County's haunted jewel, the "Million Dollar Courthouse"
All small towns have their fair share of history, scandal, and haunted locations. While many haunted tales include the stereotypical creaky house on the corner, some come in more glorious forms. 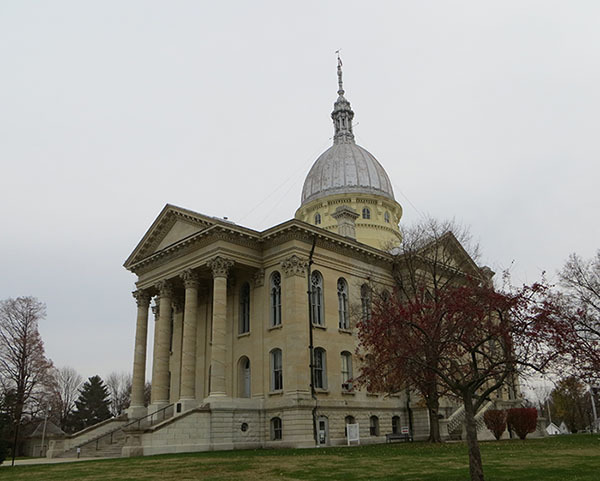 In the middle of Central Illinois, in the small town of Carlinville, you will find one of the most historic, haunted, and magnificent buildings in the state; the Macoupin County Courthouse, also known as the "Million Dollar Courthouse." Rumor has it the idea of a grand courthouse for Macoupin County started in the 1860s. There was talk about splitting Macoupin county into two separate counties which would take away the county seat from Carlinville. Many believe this idea prompted the building of the new courthouse to keep the county seat in Carlinville. It was the county court who had full reign over county affairs, including the budget and the construction of the courthouse. A group of men including Judge Thaddeus Loomis and county clerk George Holliday were in change of the courthouse project. A budget of $50,000 was set for the new courthouse, being paid for by placing a 50-cent levy on every $100 worth of property. E.E. Meyers, a Springfield architect, laid out his plans for a new courthouse created in the Renaissance Revival style. Construction began in 1867 and from the very beginning the courthouse faced scrutiny and scandal. It didn't take long to realize the budget was going to be an issue. In September of 1867 the foundation was laid and $13,000 of the $50,000 was already spent. By the time the cornerstone was laid they had spent their entire budget. The public became outraged at the excessive spending. Locals began writing into the Carlinville newspapers calling for an investigation and speculating that perhaps some of the county commissioners, including Loomis and Holliday, were stealing funds or at the very least mishandling them. Additional loans came in and the cost continued to grow. In January 1869, the cost had risen to nearly $450,000 and they still needed another $125,000 to complete the roof and dome. 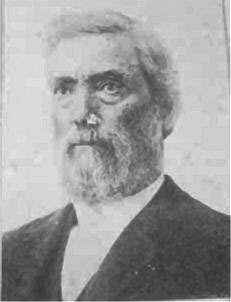 In March of 1869 state legislation was passed which granted "An Act to legalize certain acts of the county court of Macoupin County and to enable it to complete a court house in said county." Basically, the county now had authority to complete the courthouse by any means they deemed necessary. Citizens began to protest this decision and an "anti-courthouse" committee began investigating the men in charge of the courthouse construction. No arrests were made but many lost their reputation due to the courthouse spending. The courthouse was completed in 1870 with the final total cost exceeding $1.3 million dollars, which is over $24 million in today's cash. Loomis was the first judge on the bench in the new courthouse and had a custom $1,500 chair, which resembled a king's throne, assembled for him. He also completed his four-story hotel on the Carlinville Square which may speculated was built with courthouse funds. While nothing was ever proven, it was accepted that limestone used in the courthouse was the same limestone used to build the hotel. Loomis' hotel was successful for several years and still stands today, having its own scandalous history and reports of hauntings. Unlike Loomis, Holliday didn't stick around. Late one night in 1870, Holliday left town on a train without even telling his wife or children goodbye. After his departure, Holliday was indicted with at least 15 charges of larceny and embezzlement but the charges were later dropped. There were never any convictions related to the courthouse over-spending. Oddly enough, almost 10 years after the completion of the courthouse, a man named S.W. Hall was found in Washington State. Many believed Hall may be the long-lost Holliday. The man was brought to Carlinville but nobody could positively identify Hall as Holliday. The man returned home to Washington. However, suspicion grew after Hall abruptly packed up his law practice and seemingly disappeared. Was it possible that Holliday escaped once again? It took 32 thousand citizens of Macoupin County 40-years to pay off the huge debt. 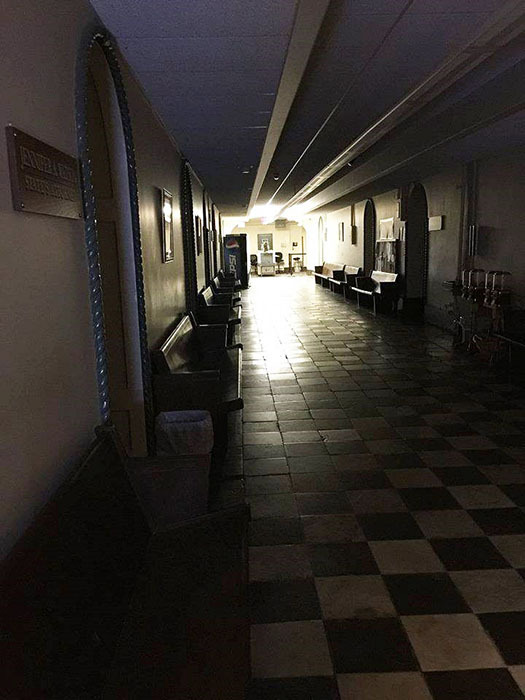 At the cost of over $1.3 million dollars, Macoupin County received the second largest county courthouse in the country, a beautiful structure that would bring visitors from around the world, and a sordid history with reports of paranormal activity. Reports of unclaimed footsteps heard in the upstairs courtroom have occurred over the years. The courtroom where these noises seem to be coming from is the same courtroom that Loomis presided over. 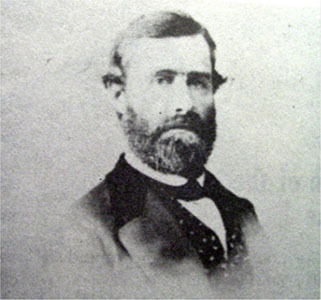 In fact, Loomis is believed to be one of the spirits who inhabit the courthouse. 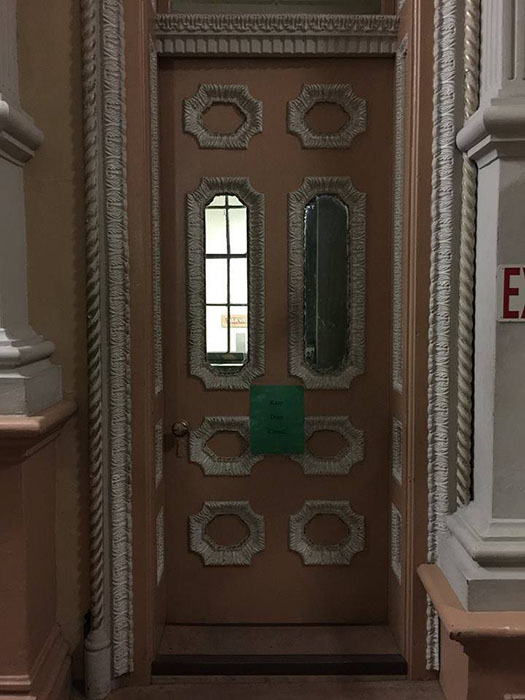 The doors to this courtroom also appear to open on their own. This is not an easy task considering the doors are made of cast iron. This courtroom is also known to create an eerie chill down the back of your spine. Some people have even refused to explore this courtroom on their own. One young lady was assisting the Haunted Carlinville tour group when she realized she wasn't alone. She was walking up to the courtroom and as she approached the door she saw a dark shadow that resembled a man. She went to open the courtroom door and the shadow pulled her back, as to keep her from opening the door. She ran down the stairs and vowed never to go up in that courtroom alone again. It isn't just the courtroom where the unexplained has taken place. Downstairs in the main entry area there have been reports of a little girl spirit. During a paranormal investigation of the courthouse two separate teams stated they contacted this spirit. Through EVPs, EMF responses, and the intuition of someone who was sensitive to the paranormal, they determined this little girl was facing some difficult times at home and was eventually adopted, having spent a lot of time in this courthouse. During the Haunted Carlinville tour, one woman was talking to the guide and getting ready to leave. Out of the corner of her eye she saw a little child running down the hallway. Upon investigation, there was no one there. On a separate occasion a young woman was walking down this same hallway and reported someone tugging on her shirt, as a child would do to get attention. Of course, there was no one present. Was it the spirit of the little girl? Numerous people, especially mothers, have felt her presence and her touch. Dowsing rods, or divining rods, have also been used on investigations of the courthouse and brought upon some interesting results. During a dowsing rod session, a series of questions were asked. A very clear "yes" was given when asked if Loomis was one of the spirits in the courthouse, the same "yes" was given when asked if little girl was present. When asking how many spirits resided in the courthouse the rods responded "yes" to the number "six" on several occasions. Investigations of the courthouse also point to one of the six spirits being someone who was tied to the police force. On two separate dowsing rod sessions, a "yes" was given when asked if the spirit had a link to law enforcement. The identify of this spirit is still a mystery. Considering the courthouses history spans almost 150 years, it's hard to pinpoint all the spirits that may exist within its limestone walls. This gorgeous courthouse is still in operation and people continue to experience unexplained activity. For those who visit the "Million Dollar Courthouse" it is a building that they will not soon forget. You can check out the courthouse for yourself during the Haunted Carlinville tours and visit their website at www.hauntedcarlinville.com for more information. You can also check out their facebook page at www.facebook.com/hauntedcarlinville. The Million Dollar Courthouse will also host American Hauntings' Dead of Winter festival on February 11th, 2017, from 12-5 p.m. This is a free event but they do ask that you bring a donation of non-perishable food which will be given to a local food pantry. The festival will include vendors, speakers in the paranormal field, and raffle items. There is also an after-hours investigation of the courthouse from 8 p.m. to 2 a.m. Reservations for the investigation must be made online and tickets picked up at the Dead of Winter Festival. You can find more information and make reservations at www.prairieghosts.com.